Rondo Alla Turca (For Two Flutes and Piano). Composed by Wolfgang Amadeus Mozart (1756-1791). 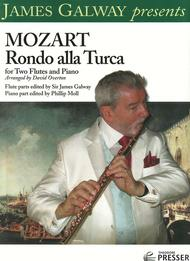 Edited by Phillip Moll, James Galway. Arranged by David Overton. Chamber ensemble. For Flute I, Flute II, Piano. James Galway Presents. Classical. Score and part(s). Standard notation. 8 pages. Duration 3 minutes, 30 seconds. Published by Theodore Presser Company (PR.114412790).With Standard notation. classical.